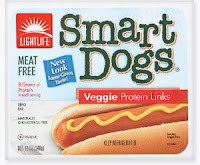 The new product to test is Lightlife Smart Dogs. I knew this was going to be a tough sell, as I'm really picky about my hot dogs. My favorite is the Schweigert All Beef Wieners (hee hee - wieners!) with natural casing, in case anyone wanted to know. For me, hot dogs are serious business. So I went in to this with pretty low expectations. First off, the package says you can either boil them or microwave them. My usual MO is to microwave my hot dogs ("until they scream" - my kitchen is a fun place), so that's what I did. Since my plan was to slice them up and mix them into some macaroni and cheese (yum! ), I took 3 dogs out of the package and threw them onto a plate. The package said 30 seconds per dog, but my microwave is pretty buff, so I went with one minute total. Okay - after a minute in the microwave, the bottoms of the dogs had sort of blistered, in a rather unappealing way, but this is sort of part of the microwaved hot dogs experience, so I went ahead. It still smelled like it did right out of the package, which was a little disappointing. They were very hot, and I used my knife to cut off a chunk. It was super rubbery, and actually took two tries to get through the top part of the skin. Once I got a bite-sized chunk separated from the rest of the dog, I took a good look at it. It was orange. Very orange. In discussions following this experience, I was reminded that the pink of standard hot dogs is chemically enhanced, but still... couldn't they have worked a little harder to get that nice chemically pink in these? Orange! I steeled myself and popped it into my mouth. Texture - Very rubbery, which didn't improve during the chewing. I fed a piece to my wife as well, and she agreed with the foulness of this experience. Luckily, we had a regular beef hot dog in the fridge, so our dinner wasn't completely ruined, but we threw out the Smart Dogs. Next time, I will try boiling them to see if that improves the experience. See what happens here. A few days later, it was taco date night. The aforementioned pescetarians arrived, and started to get excited when I told them I was making fake-meat tacos. Armed with my plans, I boldly declared that these tacos were going to be great. First step in fixing the problems I had before was to prepare absolutely everything else first. The only steps I took were to put the crumbles in the skillet, no heat, and just let them sit there, waiting for everything else to be ready. Once the other ingredients were in place, and still without applying heat, I sprinkled on the taco seasoning and added 3/4 cup water. Also, I stirred in about a tablespoon of tomato paste, just to help counteract any sweetness that may have been present. Once everything was fully mixed together, I finally applied heat. It only took a couple minutes to get it all bubbly, so I quickly removed it from the pan, and we got ready to dig in. Texture - I don't know if it was the extra water, or the not overcooking it, but this time around, it had a great texture. Nice and chewy, like meat is supposed to be, but not into the realm of rubbery. Flavor - No extra sweetness. Not sure whether this was due to not burning it, or the tomato paste, but either way I was pleased. If I hadn't known this was fake meat, I'm not sure I would have noticed any difference, at least for the taco application - I'll probably try this in other meals in the future. 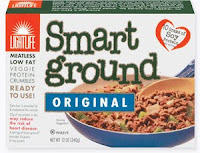 The first product I tested was Lightlife Smart Ground. I was using it to make tacos, which is slightly cheating, because one would assume that the boldness of the taco seasoning would overwhelm any weird flavors in the fake meat. This was desirable for my first attempt. Plus, tacos are awesome. To prepare the fake meat, I tossed it in a skillet, broke up the big blob of ... product. I have to admit, I was a little trepidatious. This was the test run for the actual taco date with the pescetarians, so I wanted it to go well. This stuff looked weird. Once I got it broken up into crumbles, though, it did kind of look like meat. I applied heat, and got it all warm. (no actual cooking required - a bonus for some people) I sprinkled on the taco seasoning, and stirred in however much water it called for, 2/3 cup maybe? It thickened immediately. It was freakishly fast, probably because it was already hot. I had one other thing to finish up before the tacos were ready to eat, so I let the seasoned fake meat sit on the heat for a little while to let the flavors meld. That was a mistake. When I came back to it maybe a minute or two later, it was burned. Oops. We used it anyway, since it was only burned a little bit on the bottom - I quickly scraped it out of the hot pan and into a bowl to prevent any further burning. My roommate ate it, not knowing it was fake meat, and when the deceit was revealed to him afterward, he said he thought it tasted funny. I thought it was kind of awful, and made plans to change my technique for taco date night a few days hence. Interesting note: over the next couple days, as I ate the leftovers, the texture (and to some extent, the flavor) of the fake meat improved. This gave me hope for future attempts. 2. I keep accumulating friends who are vegetarians and vegans and want to impress them with my non-meat cooking skills, since my best meat dishes aren't going to cut it with them. 3. With fake meat products usually having little to no fat, and no cholesterol, they do seem healthier than meat, so for general health reasons, it seems like a good thing to explore. When first embarking on this adventure, I checked online for reviews of the different brands of fake meats - I found the occasional review for a single brand, but nothing comparative. So-and-so thought this one brand was okay. But is it better than some other brand? Who knows? Also, I didn't find anything comparing fake meat to real meat. I wanted to know: is this tasty? or it is just tasty relative to other fake meats? How is the texture? How does it look? Would meat eaters enjoy it as well? So those are the questions I'm here to answer. I plan on giving each brand a couple tries, just to get over the weirdness factor, and possibly correct any errors in preparation, in case that affected the final product. I hope you enjoy my adventures and find them useful.